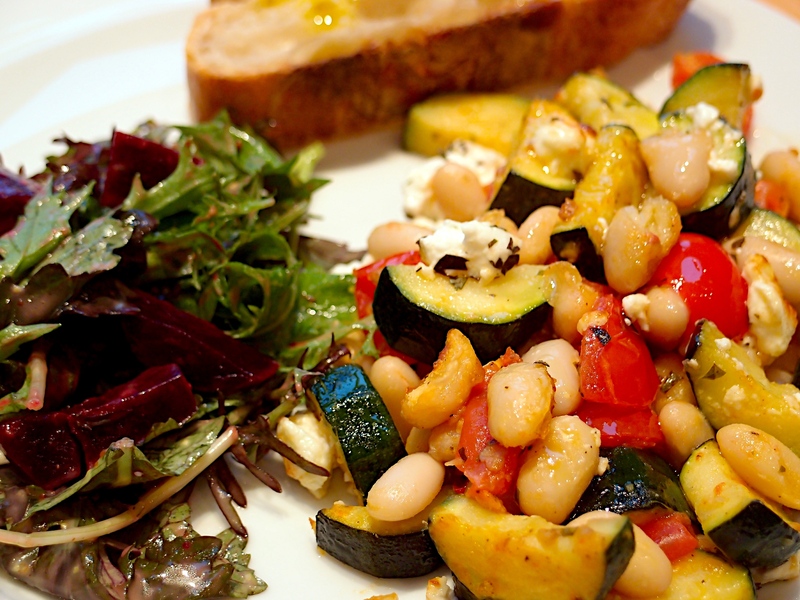 We came across this while searching for inspiration on how to use some courgettes and feta cheese that had been lurking in the fridge since the weekend. It was really tasty, very quick and cheap to make (even if you don’t happen to have any courgettes and feta in the fridge). All we had to buy today was some salad leaves and ciabatta bread to go with it. Perfect summer fare for a weeknight. Heat half the oil in a large frying pan over a medium heat. Fry the courgettes for 5 minutes or until golden. Stir in the garlic and half of the oregano and cook for 30 seconds before gently folding in the tomatoes and beans. Heat through for about 4 minutes. Season to taste, then heat the grill to medium. Transfer to an ovenproof serving dish. Crumble over the feta, drizzle with the remaining oil, then grill for 5 minutes until the cheese has turned golden brown. Sprinkle with the rest of the oregano and serve with crusty bread and salad. Wine Suggestion: Stick to the summer theme with a glass of rosé – we recommend the 2010 Chateau de L’Engarran from the Languedoc (€13.95 from Mitchell & Son). Perfectly dry and fresh; a great accompaniment to food. (Original recipe from BBC Good Food Magazine, June 2009).